Numerous parts all work together that allow you to stop on a dime when need be or slowly come to a stop when at a traffic light. Calipers, master cylinder, brake pads, and arguably one of the most essential, rotors all need to work together for the best possible braking power. The braking system of your BMW can be complicated if you don’t know what you are looking at. A rotor is the part of your braking system that the pads squeeze against allowing your vehicle to come to a stop. A wonderful thing about these parts is they can last a long time, in most cases, before needing to be changed. However, when they do need to be replaced taking it in for auto repair BMW is the best way to ensure it is done correctly. Rotors are considered a main component, and if these fail or have an issue, it will negatively affect your ability to stop precisely. You may notice strange sounds when braking, no matter how light or firm you apply the brake. The two most common problems that occur with the rotor include warping and uneven wear. The cause of these is almost certainly linked to worn out brake pads. Brake pads can wear unevenly, causing tension to be dispersed around the round inconsistently. What can happen here, is the front of the rotor will wear down faster than rear or vice versa, not allowing for even pressure. A sign this is already happening to your care is not stopping straight. If your car tends to pull to one side when coming to a stop, it might be a sign your rotors have uneven wear or damage already done to them. It could also signal that the material on the rotor has worn down, and the part needs to be replaced. 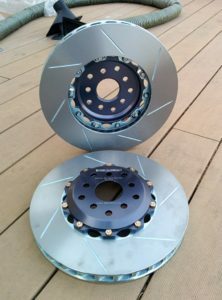 Consider upgrading to drilled and slotted rotors for better performance as well as better cooling effects for less chance of warping, if your vehicle doesn’t already have this type installed. Consider your driving technique. Do you like to ride the brake? Are you a fan of speeding up quickly only to hit the brake just as fast? How you drive will ultimately dictate how long a rotor and other braking components last. While for most adult drivers trying to change how you operate can be a challenge, it is one you should pay attention to. By modifying how you drive, or in this case stop, you can get more miles out of your pads and rotors. Instead of slamming on your brakes for each stop, start braking sooner. In doing so, your brake pads will slowly come in contact with the rotor. This action will keep your rotor in better shape for a more extended period of time. Most brake pads that come on BMW, Mini Cooper, Audis, and almost every vehicle now have an indicator on them. The indicator pin will sound like a high pitched screechy sound. Once you hear this noise, it means it is time to replace the pads for an automotive repair near me shop. Don’t delay. Putting off changing your brake pads will cause more wear on the rotor. Once you start hearing a lower pitched noise when coming to a stop, you have gone through the pads, and now the caliper may be contacting with the rotor. The low pitched noise or grinding sound makes scratches into the rotor making it virtually unusable when putting new pads on.